Someday, you may meet someone who says they don't like zucchini. Invite them to your house for this baked vegetable casserole—then see what they say! 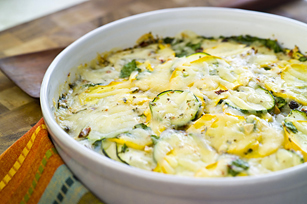 Toss zucchini with dressing; place in 2-L casserole dish. Bake 12 min. Meanwhile, beat next 4 ingredients in medium bowl with whisk until blended. Stir in 1/2 cup cheese. Add spinach to zucchini mixture; mix lightly. Pour egg mixture over ingredients in casserole dish. Bake 30 to 35 min. or until centre is set. Top with remaining cheese; bake 5 min. or until melted. Let stand 5 min. before serving. Substitute Cracker Barrel Shredded Light 4 Cheese Italiano Cheese for the mozzarella. This tasty way to enjoy vegetables can be part of a healthy eating plan.